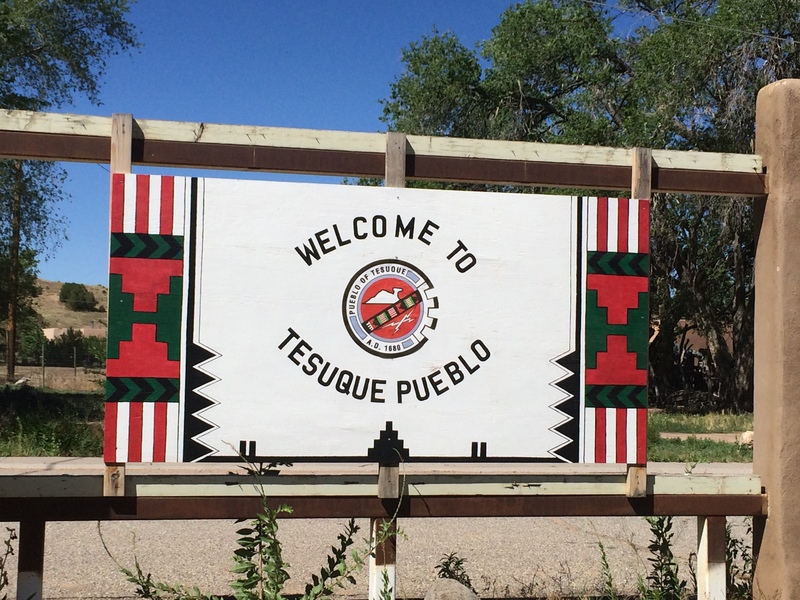 Tesuque Pueblo is one of the 8 Northern Pueblos, nestled in the foothills of the Sangre de Cristo Mountains about 10 miles north of Santa Fe. The village, currently home to about 900 people, has been in its current location since at least 1200AD, although the ancestors of the people here were farming this area many centuries before that. Some people in Tesuque today still maintain their cornfields, although far fewer than past generations. 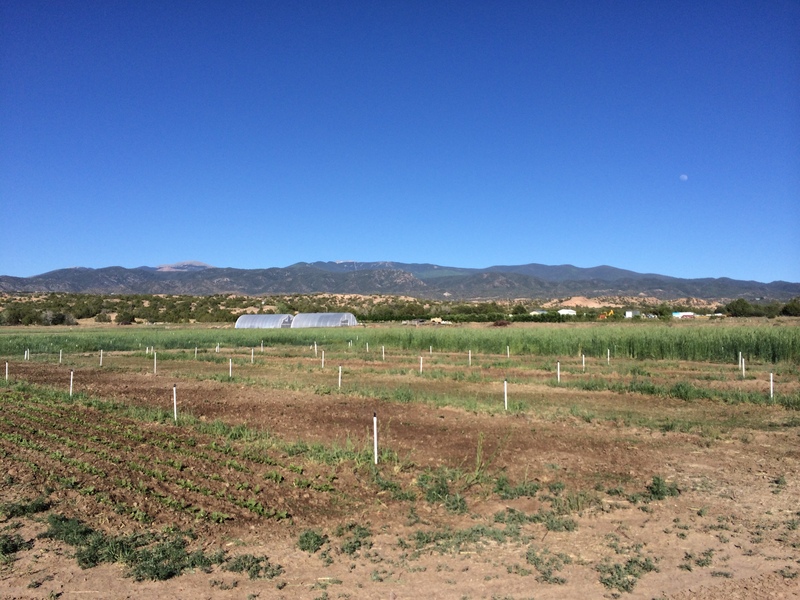 The Tesuque Farm strives to help those interested in growing their own food, in addition to growing crops for the elders and students, and saving indigenous seed from around the world. Starting in the 1970’s, the farm grew acres of alfalfa as a cash crop. But as farm employees Randy Moquino and Gailey Morgan described to me, in the early 2000’s they decided that the farm should shift its focus to produce for local consumption. In 2005 they hired Emigdio Ballon to head this project. Emigdio is Quechua from Bolivia, where after learning indigenous planting methods from his grandfather and acquiring a Masters degree in plant genetics, he worked for the government as the head of the program of high altitude crops. Emigdio was unhappy with the corruption in the government at the time, and moved to work at Colorado State University as a research assistant on projects relating to quinoa. He also helped to found the company Seeds of Change, and worked with actress Marsha Mason on her herb farm in Abiquiu NM . 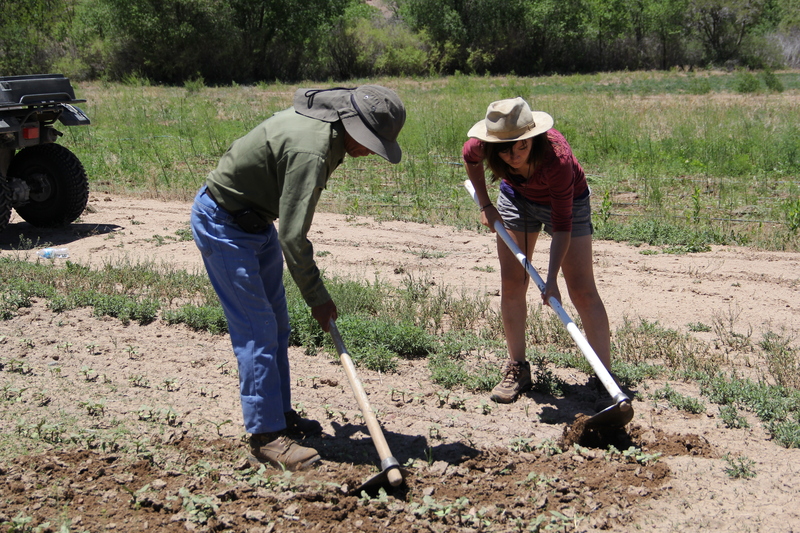 When the job at Tesuque became available, Emigdio moved there, with the goal of fostering traditional seeds and crops, and feeding the community. 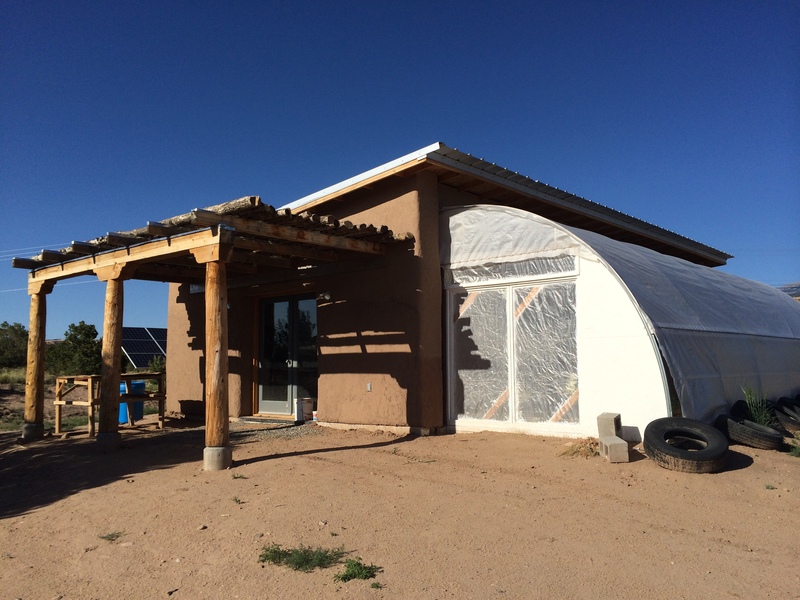 In the 9 years that he has been there working with Tesuque tribal members Randy and Gailey as well as the mechanic Eberth Reynolds (also from Bolivia), the farm has developed into an indigenous permaculture garden and orchard that has drawn visitors from across the United States, Europe, and Africa. The farm is about 60 or 70 acres, with about 25 acres currently under production, and much of it tended almost entirely by hand. On the day we arrived we were almost immediately put to work weeding the asparagus patch, a task begun by a group of college students the evening before. 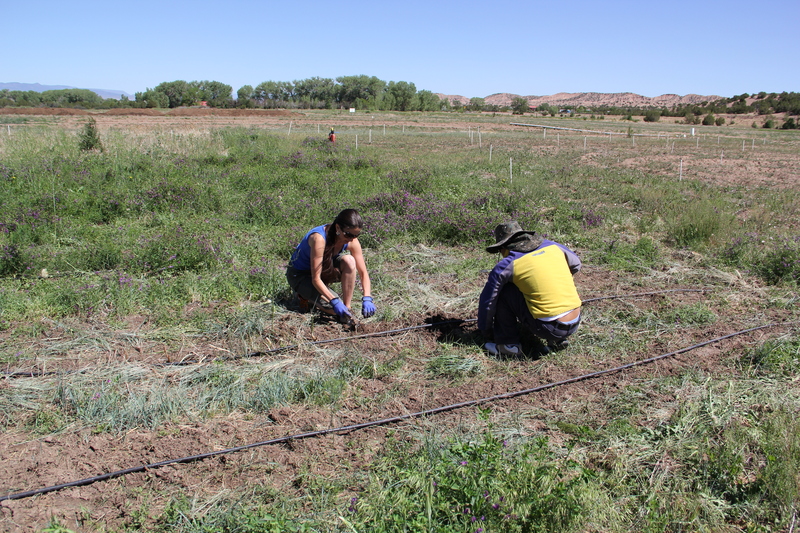 We were soon joined in the fields by more volunteers, Marissa and David Naranja from Santa Clara Pueblo and their friend Michael Brown. Marissa just graduated from the University of New Mexico, and David and Michael are students at the Institute of American Indian Arts (IAIA). 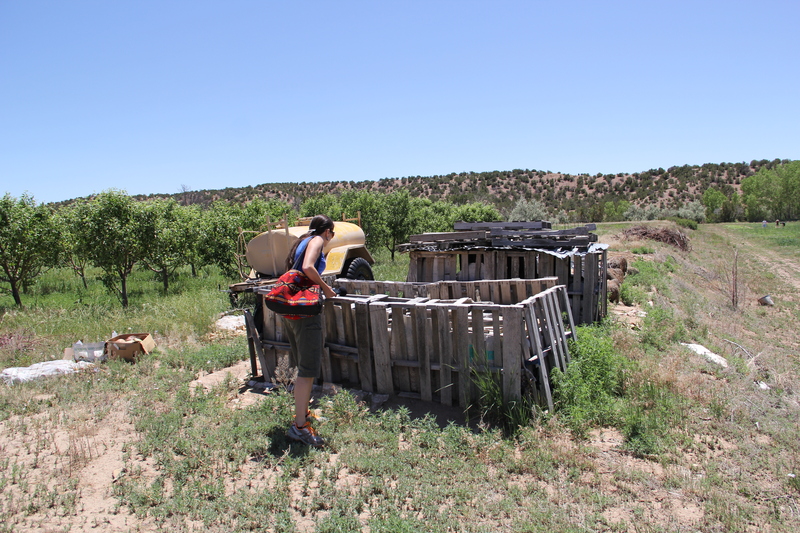 Marisa double-concentrated in Native American Studies and Environmental Ethics, and started working at the farm as a project for a class taught by Gregory Cajete . 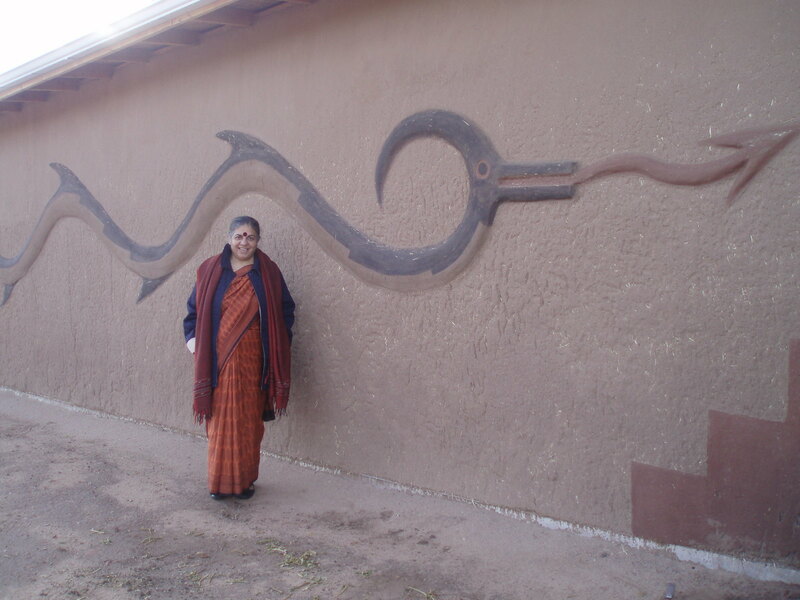 She kept coming back after the class was over because she was not only learning the farming skills like transplanting plants or building hoop houses with natural heating and cooling systems, but because she enjoys learning the cultural importance of her connection with the plants and the earth. She credits Emigdio with helping volunteers learn “about how to be your best self out here.” She is taking the knowledge she has learned at the Tesuque farm back to her community, where she will be creating an internship program this summer pairing youth and elders on gardening projects. 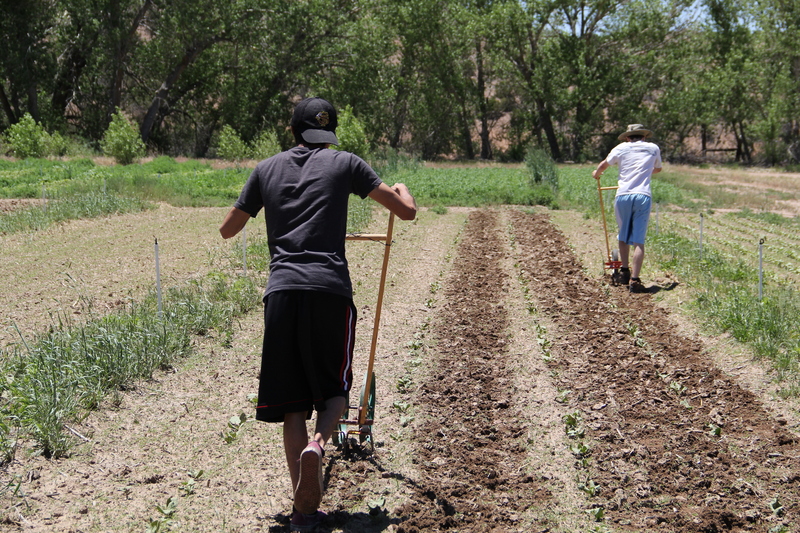 Volunteers like the students are imperative for this project: in addition to tending this farm, farm employees also prepare fields for community members interested in growing (this past spring they prepared 20 fields), as well as trying to grow their own crops. Gailey was also appointed to tribal council this year, and Randy is on a water committee, jobs that draw their attention to other needs in the community. 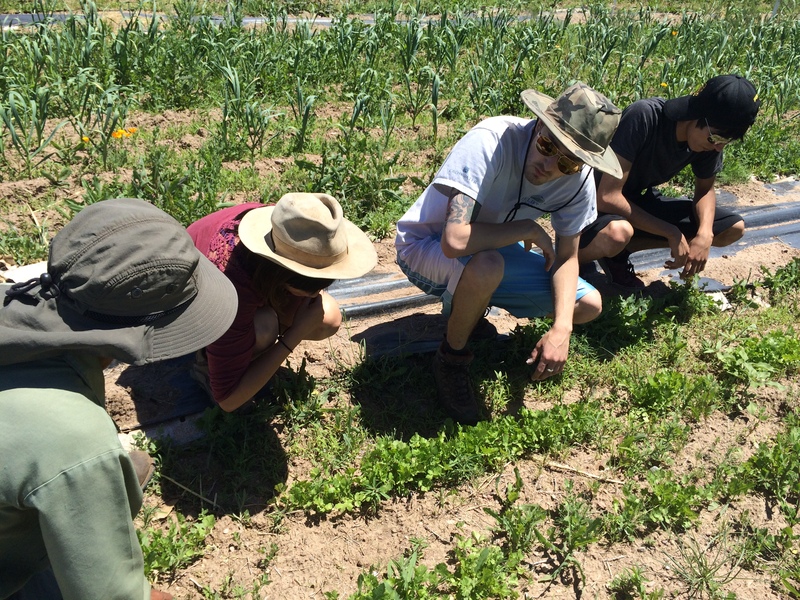 Emigdio gave us a tour of the fields and orchards, past food crops like beans, sunflowers, cilantro, quinoa, squash, and garlic, planted together with medicinal crops like yarrow, plantain, stinging nettles. Cover crops like buckwheat have been planted in many of the beds to try to control bindweed, the most prevalent weed in the garden, which aside from its benign little saucer shaped white flowers, strangles the other plants and will reappear if even a piece of its root is left behind. There is also an orchard of several types of apples, apricots and cherries, although late freeze two years in a row destroyed the buds and prevented fruit. Elk have also been a problem, eating the branches of the trees and the fruit in the years it has been available. 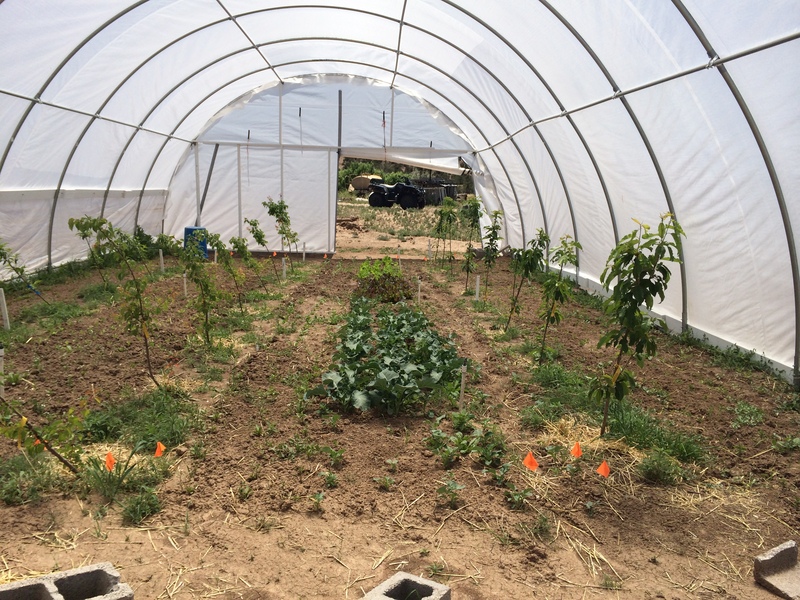 To help remedy this, the team has begun planting trees inside hoop houses, tilting them at an angle, trimming downward facing branches and encouraging upright branches. In the coming months they will also be building vertical walls of strawberries in the hoop houses, as several years of trying to cultivate them outdoors did not prove fruitful. The produce from the garden goes to feed the elders, as well as to local schools. In addition to food, the farm also grows plants for seed. 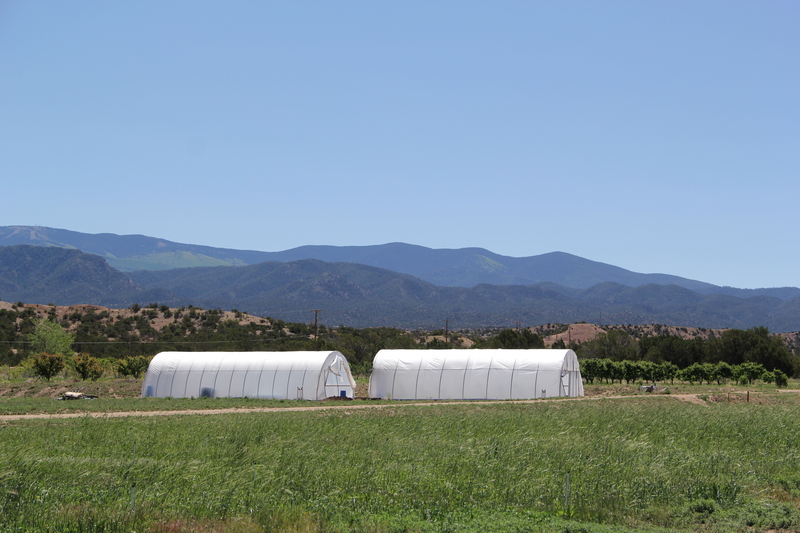 The farm has seed contracts with herb companies in Santa Fe and Oregon, and also works with companies like Seeds of Change and Native Seed SEARCH. These companies will sometimes send seeds for them to grow out for them, and other times will inquire to see what is available. 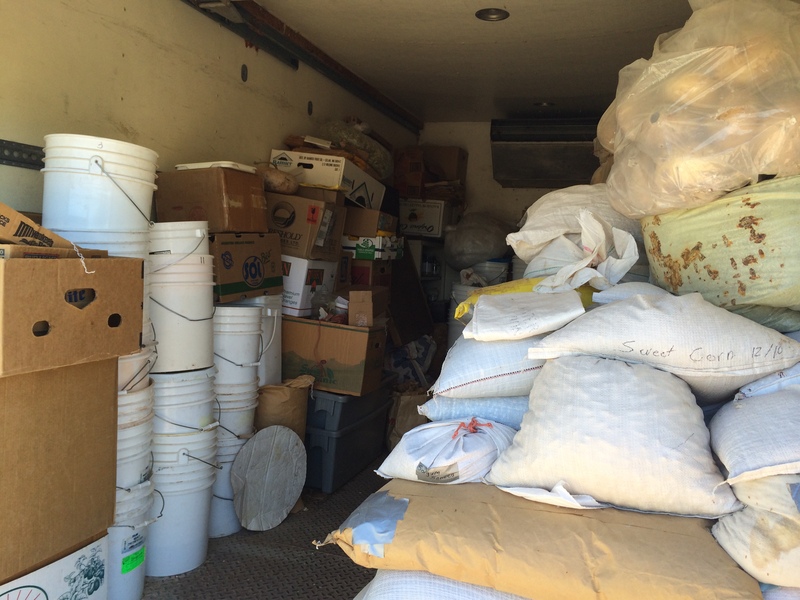 The projects vast seed collection had been stored for years in the back of a truck, but in 2013 the tribe built a beautiful cobb seed bank, constructed with clay, sand, hay bales and tires. A small greenhouse built off to the side currently shelters 16 different types of tomatoes and a medicinal plant from Africa that is supposed to be useful in the treatment of cancer, diabetes and AIDS, according to the medicine man who gave it to Emigdio in South Africa. 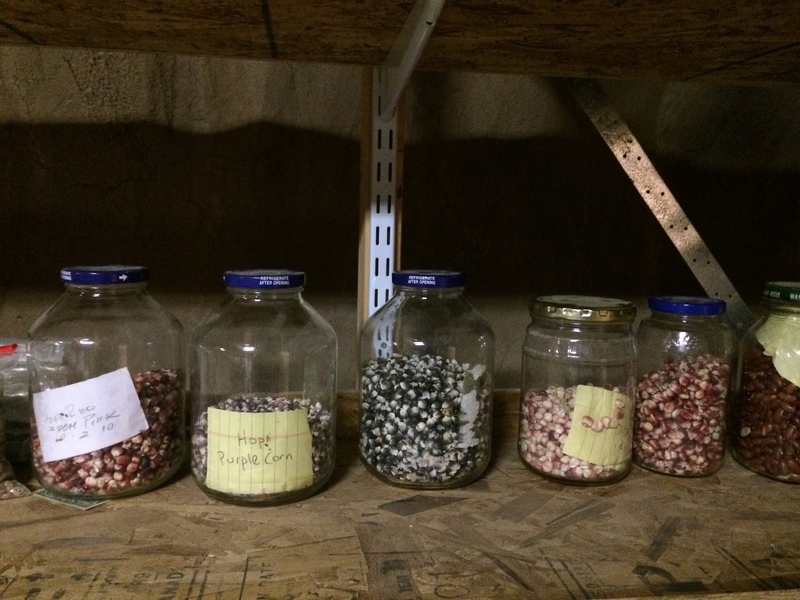 The seed collection in the basement of the seed bank is eclectic, consisting of indigenous varieties of food and medicinal plants from around the world, but focused in the southwest, including Hopi and Pueblo corns, beans, squashes and melons. Protection of these seeds has been an important goal of this community. 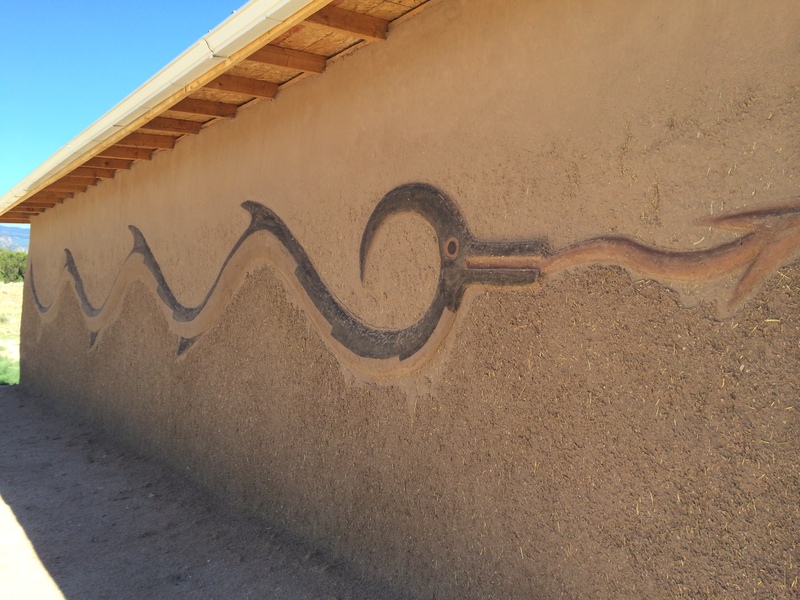 Recently the Eight Northern Indian Pueblos drafted a resolution banning GMO seeds (see the upcoming post about Clayton Brascoupe and the Traditional Native American Farmers Association for more information). Gailey brought this resolution with him to the National Council of American Indians meeting in Alaska, to try to convince other tribes to adopt similar resolutions. Marvelous project. I hope in the near feature we can collaborate.